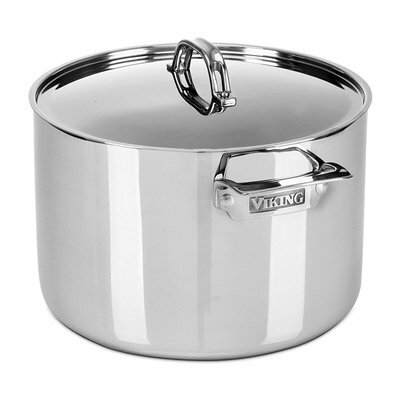 Viking 3-Ply mirror polished cookware is designed for the culinary enthusiast desiring restaurant quality results. Handcrafted in the USA, the Viking 3-Ply mirror polished cookware is manufactured with a Multi-Ply construction. Our 3-Ply grade cookware is constructed with layers of metal that include a pure aluminum core sandwiched between induction friendly high-grade stainless steel. The aluminum layer transfer heat quickly and consistently through all areas of the pan for even cooking while requiring less energy to achieve desired temperatures. The Viking 3-Ply mirror polished cookware is suitable for all cooking surfaces; gas, electric, halogen, ceramic and induction. This exclusive Multi-Ply construction includes a layer of magnetic stainless steel for induction cooking capability. The ergonomic stainless steel stay cool handle, a Viking Design exclusive, provides maximum comfort and secure handling. Constructed of investment-cast stainless steel that balances the pan with the wrist and forearm, making lifting a full pan easy. The stay-cool vent design which provides maximum comfort and secure handling. Backed by a lifetime limited warranty, Viking cookware will help you produce restaurant quality results. Durable 3-ply construction with 18/10 stainless steel interior and an Aluminum core for even heat distribution. Induction capable stainless steel exterior. 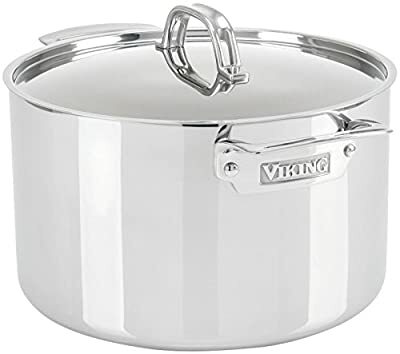 Ergonomically designed Viking stay cool stainless steel handles are designed to be comfortable and easy to hold while reducing heat transfer to the handle. Viking cookware is exceptionally efficient. For optimal performance and most types of cooking, energy-efficient LOW to MEDIUM heat is all that you will need. A higher heat setting would be used for boiling. Suitable for all cooking surfaces; gas, electric, halogen, ceramic and induction. Designed to be used in the oven the same way professional chefs use their cookware in a restaurant kitchens. Proudly handcrafted in the USA. Backed by a limited lifetime warranty.